SEPT – Backpacking the Back Country at Bear Creek Scout Reservation! 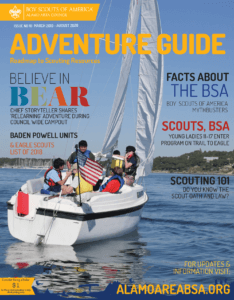 The Bear Creek Adventure (BCA) is a weekend at Bear Creek Scout Reservation in preparation for a Philmont Experience, but it is not limited to Philmont Bound participants. Any Scout, Venturer or adult leader is invited to attend this backpacking experience through parts of Bear Creek that most do not get to see. You start your adventure on Friday night with a cracker barrel and fellowship and conclude on Sunday morning with a hike in from the outpost. The cost is $15.00 per person and this covers your cracker barrel, Saturday night dessert and a patch. Come learn and experience the adventure of backpacking ethics in the backcountry at Bear Creek. For more information contact the High Adventure Chairman, Jim Causey at: jimbosa53@gmail.com.